While walking a path through the wetlands of California’s Martinez Regional Shoreline on November 2nd of last year I saw this bush and even from a distance I figured I was looking at some sort of Baccharis. 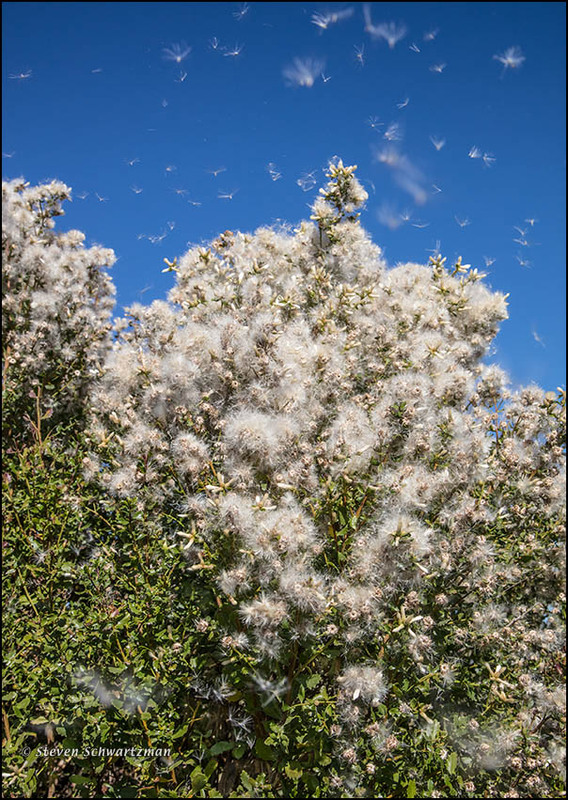 It turned out to be Baccharis pilularis, known as coyote bush, chaparral broom, and bush baccharis. I’ve never neglected Austin’s species of this genus, Baccharis neglecta, as you can confirm by scrolling down the posts at this link. Miss Coffee Bean here…this is interesting. I don’t remember ever seeing this plant out there. It has a look of dry country to me which actually makes sense, now that I think about it. I always associated California with moisture but it is really pretty dry. Good point. The cloudforests are the exception in what is largely a dry region. That’s particularly apparent in the southern half of the state, which includes places like Joshua Tree and Death Valley. By coincidence I’ve begun reading a book on gardening naturally, including native plants. Coyote Bush specifically got a mention. It encourages me to learn of a groundswell movement of gardeners beginning to embrace, rather than thwart, nature. May the groundswell continue to swell. And may it bloom and come to fruition. Fruition is good. I like fruit. I often pay an allergic price for my pictures. Fortunately this wasn’t one of those times. I think I would have needed a second look. The mounded-up heaps of fluff reminded me at first of large stands of Clematis drummondii, and the plant doesn’t seem as willowy as B. neglecta. On closer inspection, I saw the charming little tufts that appear to be typical across species. I was surprised to read that there are around 400 species of Baccharis. Wow: I didn’t realize there are around 400 species of Baccharis. Nature definitely hasn’t neglected the genus, much to my (I hope future) delight. I sometimes mentally blend Baccharis and Clematis, but then I remember the tufts that are the hallmark of Baccharis and that Clematis lacks. In this case my instinct immediately said Baccharis and never faltered.